While being aware of Sam's Throne for near 30 years...I have...for some reason...never visited the area. It seems to be a rock climbing mecca...and the couple of times I have stopped there the crowds were a bit much for me. Well on Wednesday the 4th-o-July my wife Elita and I were in the Jasper area and after eating a late breakfast (they don,t open till 8:00) we decided to check out Sam's Throne. If you have never eaten at The Cliff House just south of Jasper on Hwy 7 you really should...for it is a cozy little place overlooking the Grand Canyon of the Ozarks. 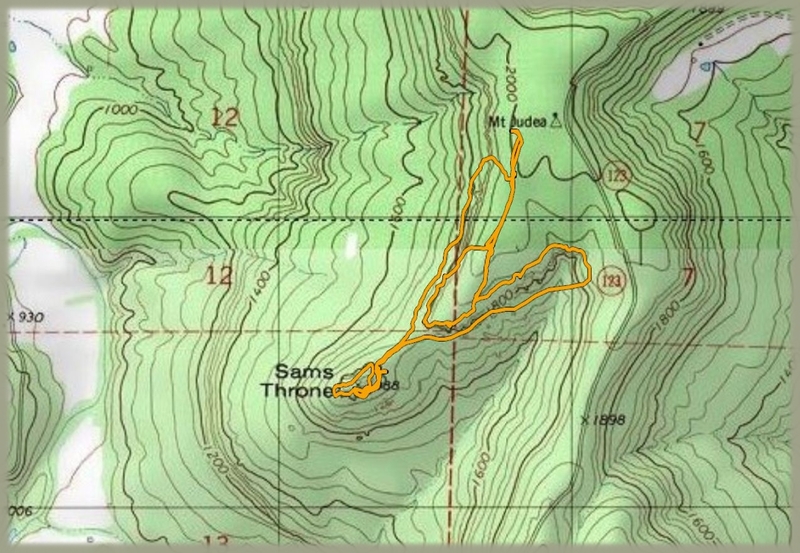 Sam's Throne is just south of Mt Judea on Hwy 123. There is a campground there that is rather unusual in that it is not an official campground operated by the Forest service but built and maintained through private funding. A forest ranger dude told me this. There seems to be no charge for camping there. 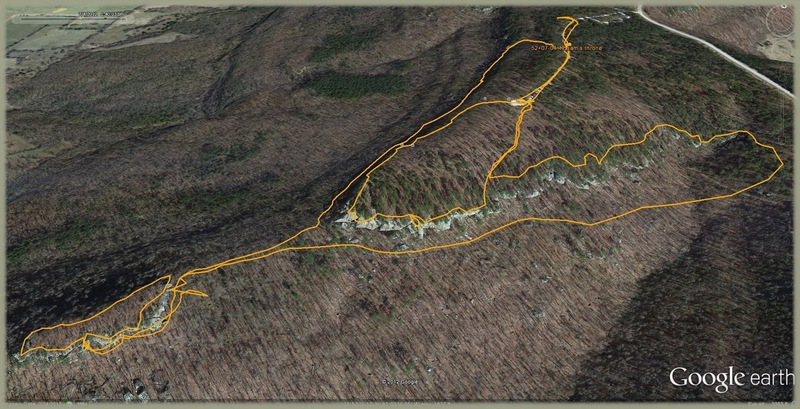 It is a short hike to the very long bluff line that runs north to south and then east to west. This very bluff line was really a surprise to me and it is one of the coolest I have come across in Arkansas. There is evidence of much use and expect to find crowds there in good weather. The views are very nice...even though the feel of being in the middle of nowhere is hard to find since there are many farms in the Big Creek Valley below. It is still a beautiful place and would probably be fantastic for watching sunsets from. We hiked most of the trails above and below the bluffs and went out to the island that is Sam's Throne. There is a slot down the bluff line that allows access to the trail that crosses the narrow gulf over to the throne. It is not easy to find and the trails are not marked as to what goes where so trial and error was how we discovered where the trails led. The access to the top of Sam's Throne requires a tight little climb that some might prefer not to use...but it is an easy scramble to the top. Bluffs cover only about a half of the island but the views from there are also pretty spiffy. It was sunny and temp in the upper 90's. No ticks observed again! This is a groovy area and easy to hike around on...so see it if you ain't yet. We hiked from 10:30 to 1:30 and saw about 6 people until a camp bus from Missouri pulled up and scattered a bunch of campers all over the bluff. Total mileage about 3.3.